The Embraer Phenom 100's avionics are powered by a system mainly developed by Garmin called the Prodigy Flight Deck 100 or the Garmin Prodigy Flight Deck 100. Garmin and Embraer worked together to develop the avionics system for the Embraer Phenom 100 jet. The Garmin Prodigy Flight Deck 100 is actually the Garmin G1000 avionics suite with some extra features. The main extra feature included with the Garmin Prodigy Flight Deck 100 is an integrated maintence computer. This makes the Garmin Prodigy Flight Deck 100 to have slightly better features then a regular Garmin G100 avionics suite. The Garmin Prodigy Flight Deck 100 has 3 glass displays that are 12.4 inches wide. All screens can display interchangeable information formats. Soft keys located on the Prodigy Flight Deck 100 displays. 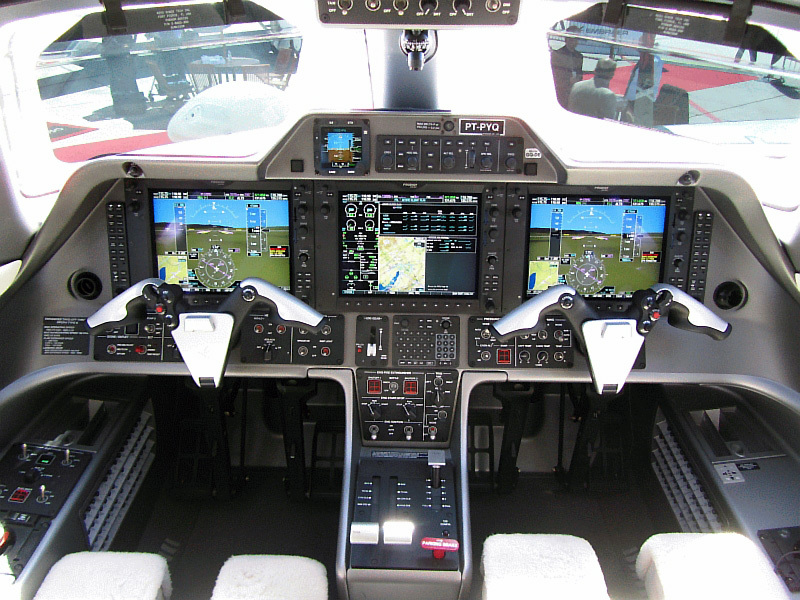 Engine Indication and Crew Alerting System (EICAS) is included as apart of the Garmin Prodigy Flight Deck 100. Electronic Stand-By Instrument included above center screen. The Garmin Prodigy Flight Deck 100 avionics is a Garmin G1000 avionics system with special upgrades integrated by Embraer and Garmin. Above Prodigy Flight Deck 100 - Garmin Prodigy Photo by Waerfelu on Wikimedia Commons. Photo (Only) released under a Creative Commons License.